History: Purchased by Fabien Kuntz in June 2014 from a dealer in Ouarzazate, Morocco. Physical characteristics: Dark gray, mottled stone (166.3 g) with some larger light gray clasts and interstital black regions. Petrography: (A. Irving and S. Kuehner, UWS) Relatively fine grained fragmental breccia composed of mineral clasts of anorthite, olivine and pigeonite, with accessory merrillite, Mg-ilmenite, Ti-rich chromite, kamacite, Cr-Mg-Zr-Fe titanate, baddeleyite, and rare troilite and barite. Geochemistry: Olivine (Fa27.0-29.7, FeO/MnO = 81-83, N = 3), pigeonite (Fs22.5-47.8Wo9.8-12.5, FeO/MnO = 55-69, N = 3), plagioclase (An91.4-96.0Or1.1-0.3, N = 2). Bulk composition (R. Korotev, WUSL) INAA of subsamples gave the following mean abundances (in wt.%) FeO 5.7, Na2O 0.49; (in ppm) Sc 9.4, Ni 460, La 14.5, Sm 6.5, Eu 1.31, Yb 4.4, Lu 0.60, Hf 5.1, Th 2.1. Classification: Lunar (feldspathic breccia). 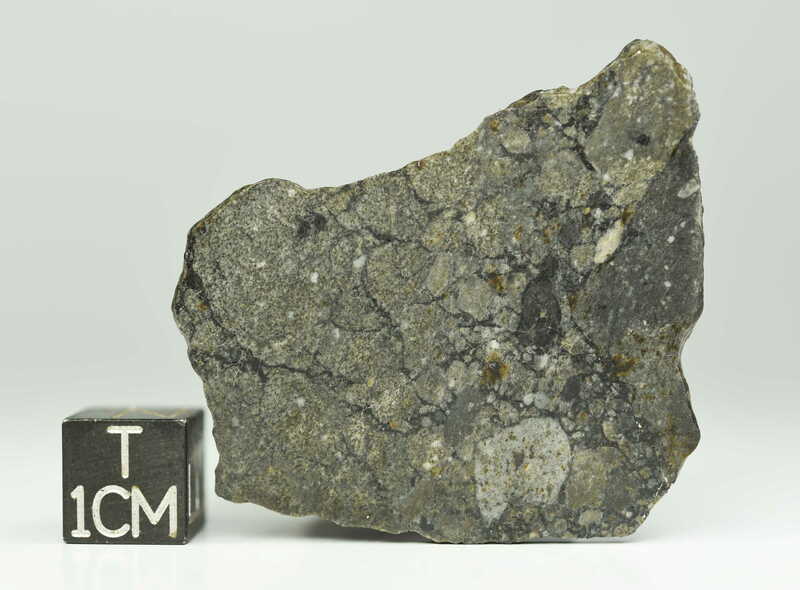 Close similarities in texture, mineralogy and bulk composition suggest that this specimen is paired with NWA 8455. Specimens: 20.3 g including one polished endcut at UWB; main mass with Kuntz.